What is a family portrait? Is it a cherished picture of a single core family? Or perhaps specifically not. Usually, when we think of a family portrait, photos of our near and distant past immediately pop up and rise into our mind´s eyes: around the holiday table, on a trip into nature, at the beach, at Grandma and Grandpa´s house, etc., etc. What is the ultimate family portrait? It may be a picture that has become an icon for the family, that has gone beyond the category of the banal, the everyday, and entered into the category of the holy, the eternal. Is this how we feel about the pictures that have come down to us from our grandparents´ homes, pictures that were hanging for generations in the living rooms of the family? Perhaps these are pictures that are even more primal, more tribal. These may depict scenes of the beginnings of a new tribe, a new people, or a new religion. Is there any more ultimate and more holy (and more painted) family than the family of Miriam and Joseph of Nazareth? This family has gone through so many transformations and has adopted so many different appearances. We all know well the scene of the birth in the manger, or the Crucifixion in the Calvary from imaginative portraits. There always appears the father, the mother and the son. As time passed, though, in addition to the core family, portraits of the underwriters of the paintings were added – usually outside of the picture, to the right or to the left, as if they sought to be also included in this family, or at least to bask in its holiness. 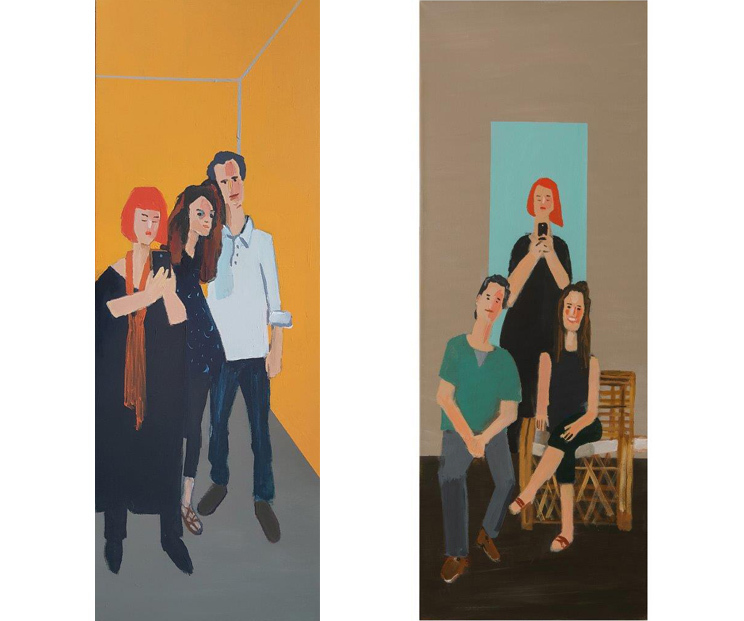 In this exhibition, "The Artist´s Family," are four presentations depicting different perspectives of a family portrait. 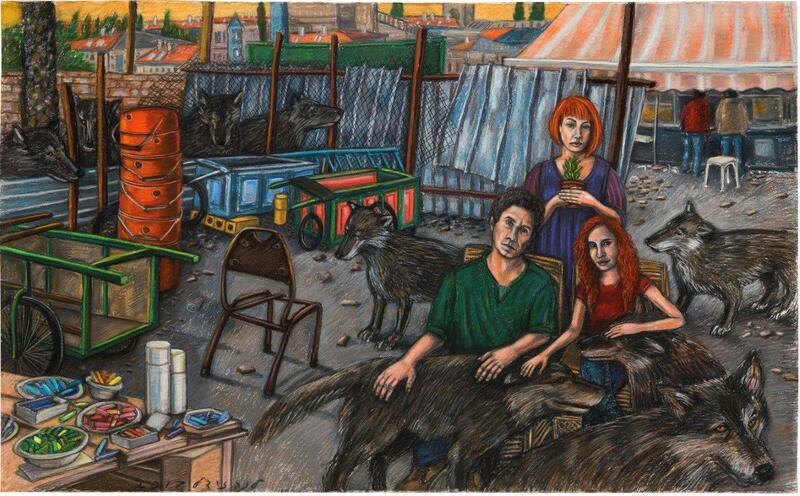 Lena Zaidel places her family within a painting of hers from 12 years ago. In this imaginary scene of the streets of Jerusalem´s Old City, near the wretchedness and filth on the ground is seen the artist´s painting materials on the table – pastel chalk and spray cans. Does this mean that the artist´s family is essentially holy? Lena-Miriam is standing in the back, holding a flower pot that perhaps symbolizes the holy spirit, while sitting in front of her are Oded-Joseph, the father, and Neta-Jesus, the daughter. In the painting are also the artist´s/mother´s soul-wolves cuddling with the father and the daughter, as if they seek to get the family to sense with their fingertips the artist´s beatings on their black furs. 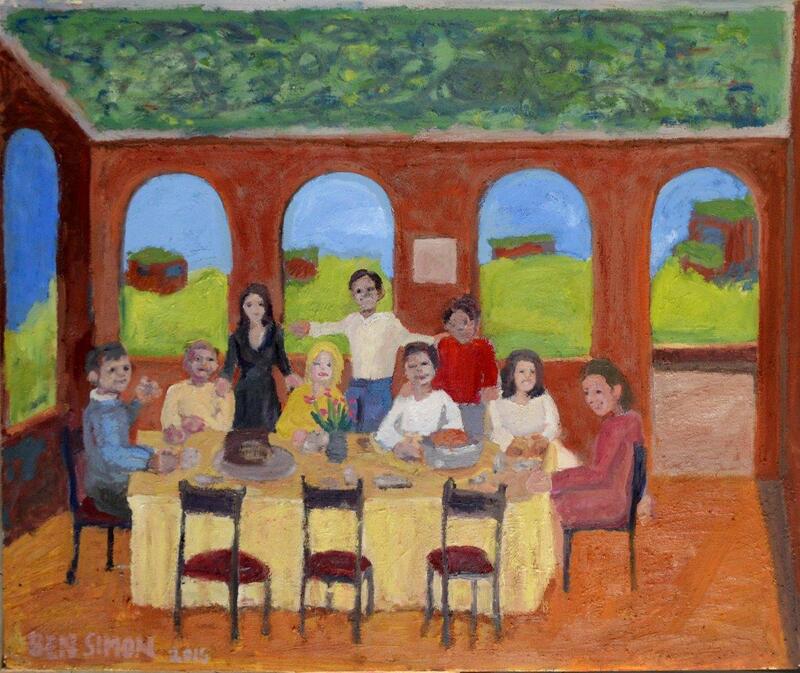 Ben Simon places in his painting figures that are not his family members, but persons that were born literally on the canvas around the festive table in the sukkah. Here is a near symmetrical scene that may bring to mind da Vinci´s famous scene of the Christian Last Supper. 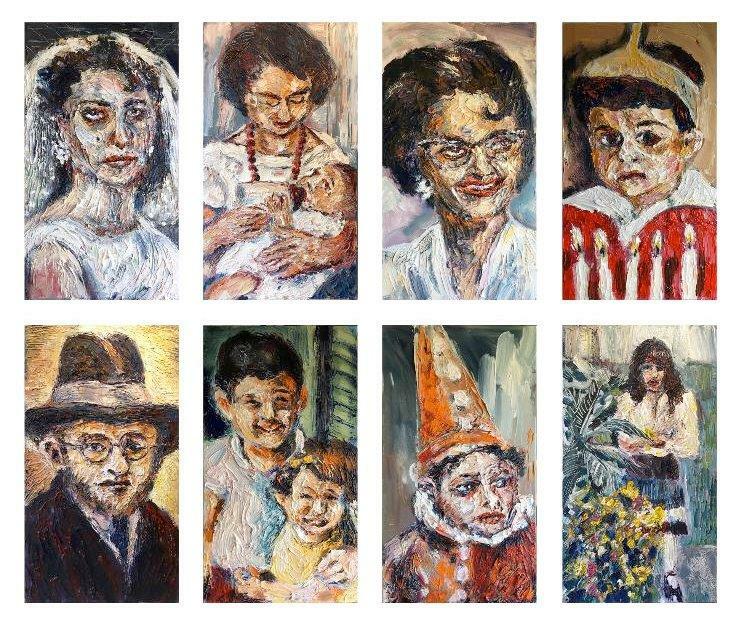 Simon painted images of people who have no family ties between them, and as such, observers are able to see themselves as these figures and participate with the painted family. Is this sort of an ultimate family portrait? Oded Zaidel elevates the banal perpetuated as a typical "selfie" scene. Here the family´s mother extends her arm holding a cellphone and captures a family moment. The three appear in the painting: the mother, Lena; the father, Oded; and the daughter, Neta, and this image will immediately be uploaded to their Facebook page. Is this meant as a challenge, or perhaps it is specifically compassion, or maybe it is a dialogue with his wife Lena´s "holy family"? Yossi Waxman chooses to present a family album of eight portraits. This album seems to depict the stages of creating a family: a wedding, a birth, childhood, teenage years, old age – the life cycle in which the mundane takes place, but also the moments when apparent "holiness" is present. Why is the bride weeping, and why does the child before the Chanukah candles have a sour face? The portraitist as family member catches different moments and memories for posterity.